In the meeting of the Dharam Parchar Committee held on 26th Asu, Nanakshahi 535 or October 10, 2003, by way of resolution N. 6000, it was decided that all Gurdwara Sahiban under Section 85 [historical Gurdwara Sahibs] should arrange to have the Larivaar Saroop of Sri Guru Granth Sahib parkaash. THis directive is 4 years old. Did anything happen on the ground ? I dont think so. 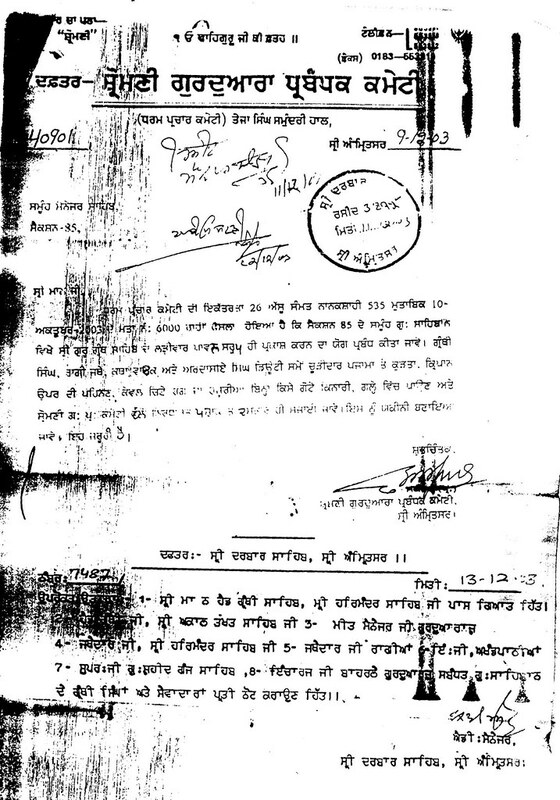 We mentioned about this several months ago on this forum but at that time as we read in a news paper was that the directive was from Sri Akal Takhat Sahib then later on we also done our own investigation and found same as what admin posted above. Sri Akal Takhat Sahib already concluded above about 50-60 years ago. We confirmed through our sources that some Historical Gurudwaras under SGPC where Singhs went to, are already following this directive. It is very good move and SGPC deserves enormous amount of congratulations for this step but still the thing needed to see for how long this directive remains effective. You can also check this in fact Sangat who is reading should do them self a favor to visit as many as historical Gurudwaras to see. Now the question remains for Gurudwaras abroad what their committees are going to do?